Mechatronics specialists play an important role today. Like a "jack of all trades", these technical professionals know how to install a new machine, make necessary connections to electronic circuits, and design required control software. The result of a union of electronics and mechanics, success in this field requires an understanding of robotics, pneumatics, hydraulics, and artificial intelligence. 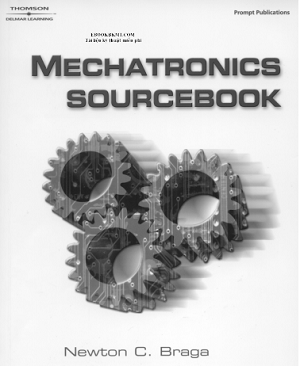 These topics, and more, are the subject of our new Mechatronics Sourcebook. A "must" for anyone who designs, studies, or works with mechatronics projects, the book begins with a review of basic chemistry and physics principles, as well as key mechanics formulas. Later chapters invite readers to explore pneutronics and hydronics applications, electric motors and relays, servo systems, power electronics and power supplies, and more. Relevant information on microcontrollers and microprocessors, PC interfacing, memory applications, programmable controls and digital logic is also included, providing immediate and hassle-free access to all of the information required for success as a highly-skilled, professional mechatronics specialist.